Robert De Niro in the Mission working off sin by ourward deeds. This is the good news! (That's the literal meaning of the word "gospel" good news!) That is what the true church of our God has the privilege of proclaiming ... "liberty to the captives"! (Lk. 4:18). Before we can understand what Catholics are taught about salvation, we must first see what they are taught they need to be saved from. In Matt. 1, the angel of the Lord speaks to Joseph in a dream about his betrothed, Mary, saying "she will bear a Son. and you shall call His name Jesus, for it is He who will save His people from their sins" (vs. 21). Today, many evangelicals toss around the term "saved" without much thought. "When did you get saved?" someone might ask. It's almost like a title, or a badge that a person wears to prove that he's become part of the club the "saved" club. Others are under the impression that when a person talks of being "saved", they are talking about being saved from many different things sickness, death, the devil, hell, etc. But when the angel of the Lord used that precious word to prophesy that Jesus would fulfill all the predictions of the prophets, he made very clear what Jesus was coming to save His people from...their sins! In official Roman Catholic theology, this too is the main thing that people are taught they need to be saved from their sins. But the only thing that Catholic and evangelical teachings have in common on the subject of sin...is the spelling! For when a Catholic talks about his "sins", you must find out first if he is talking about "mortal" sins, or "venial" sins. And then you must ask him "how do you get rid of them?" The answer given will most likely confound a non-Catholic. For words like "faith", "repentance", even "Jesus" will usually be missing in the answer. Instead, a whole new list of other words will have to be learned, defined, and understood before the evangelical can fully grasp how a Catholic is taught his sins (and the penalty due them) can be canceled out. The first of these unfamiliar words are the names of the two groups Rome has separated all sins into. Now if you're a Catholic, you might be wondering why I'm making such a big deal for the dividing of sins into two distinct categories (each with their own set of consequences and remedies) has been part of Catholic doctrine for a long, long time. For instance, until Vatican II (a church council that met between 1963-1965) it was a mortal sin to attend a Protestant church, to own or read a Protestant Bible, or to eat meat on Friday! Oh, and it's still a mortal sin to "miss Mass on Sunday morning ("Sunday obligation" can also be fulfilled by attending a Saturday evening Mass) without a good excuse" (which means that considerably more than half of the claimed Roman Catholic membership throughout the world is constantly in mortal sin!) Venial sins include things like thinking bad thoughts, having wrong motives, losing your temper, etc. things that do not necessarily "lead into actual sin" but still, nevertheless, are sins that need to be eradicated in some way. The Bible makes no distinction between mortal and venial sins. There is in fact, no such thing as a venial sin. ALL SIN IS MORTAL! It is true that some sins are worse than others, but it is also true that all sins if not forgiven bring death to the soul. The Bible simply says: "The wages of sin is death" (Rom. 6:23). And Ezekiel says: "The soul that sinneth,. it shall die" (18:4). In the light of these biblical statements, the distinction between mortal and venial sins is shown to be completely absurd. In fact, the very act of classifying sins into "greater and lesser" is immoral in itself. We know how quick human nature is to grasp at any excuse for sin. Rome seems to be saying "these sins are really bad! But those? Well . . . you can get away with a few of them and not really suffer too much". Speaking of "getting away" with something, let's get right down to how Rome teaches you can "get rid of" your sins. The Catholic system starts to get real complicated when we begin to look at the ways one can erase both their mortal and venial sins. "Two kinds of punishment are due to mortal sin: eternal (in hell forever), and temporal (in purgatory). Eternal punishment is canceled by either baptism (which is only allowed once in a person's life--and if a person were to die immediately after baptism, Rome says he will go "straight to heaven". Otherwise, the only other conditions by which a Catholic may be assured he will go directly to heaven immediately upon death, is to die a "saint" – a completely perfect and sanctified person, or to die a martyr's death. All others must do some time in purgatory.) or confession to a priest.'" The Baltimore Catechism defines confession as follows: "Confession is the telling of our sins to an authorized priest for the purpose of attaining forgiveness." The important words here are "authorized priest". And to be genuine, a confession must be heard, judged, and followed by obedience to the authorized priest as he assigns a penance, such as good works, prayers, fastings, abstinence from certain pleasures, etc. A penance may be defined as "a punishment undergone in token of repentance for sin, as assigned by the priest" usually a very light penalty. The New York Catechism says, "I must tell my sins to the priest so that he will give me absolution (release from punishment; acquittal; remission of sins declared officially by a priest--Webster's Dictionary.) A person who knowingly keeps back a mortal sin in confession commits a dreadful sacrilege, and he must repeat his confession." Canon law 888 says: "The priest has to remember that in hearing confession he is a judge." And the book, Instructions for Non-Catholics says: "A priest does not have to ask God to forgive your sins. The priest himself has the power to do so in Christ's name. Your sins are forgiven by the priest the same as if you knelt before Jesus Christ and told them to Christ Himself." (p.93). Technically, venial sins need not be confessed since they are comparatively light and can be canceled by good works, prayers, extreme unction (one of the seven sacraments also know as "anointing of the sick" or "the last rites", and administered when a person is near death.) etc., but the terms are quite elastic and permit considerable leeway on the part of the priest. It is generally advised that it is safer to confess supposed venial sins also since the priest alone is able to judge accurately which are mortal and which are venial. The Baltimore Catechism says: "When we have committed no mortal sins since our last confession, we should confess our venial sins or some sin told in a previous confession for which we are again sorry, in order that the priest may give us absolution" (p. 329). What chance has a poor sinner against such a system as that? As an example, a minister friend of mine who was brought up in the Catholic Church, tells the story of how his older brother went to confession every single week and confessed the same sin to the same priest and was given the same penance in order to receive absolution. This went on week after week, year after year. One day, while on a trip away from home, he decided that he would not break his pattern of going to weekly confession, so he went to another Catholic Church in thecity he was visiting. He went into the confession box and confessed the same sin to a different priest. He began with "forgive me Father for I have sinned", and then began confessing the sin once again, but this time he was shocked when the priest said: "But my son, that's not a sin!" My friend's brother got up, and hurried out the door, and from that day on he has never stepped foot in any church again. ​We search in vain in the Bible for any word supporting the doctrine of "auricular confession" (the official title for confession to an authorized priest in a confession box. It is called "auricular" because it is spoken secretly, into the ear of the priest.) It is equally impossible to find any authorization or general practice of it during the first 1,000 years of the Christian era. Not a word is found in the writings of the early church fathers about confessing sins to a priest or to anyone except God alone. Auricular confession is not mentioned once in the writings of Augustine, Origen, Nestorius, Tertullian, Jerome, Chrysostem, or Athanasius all of these and many others apparently lived and died without ever thinking of going to confession. No one other than God was thought to be worthy to hear confessions or to grant forgiveness. The Scriptures teach that "only God can forgive sins" (Mark 2:7). "The Son of man has authority on earth to forgive sins" (Matt. 9:6). Dr. Zachello tells of his experience as a priest in the confessional before leaving the Roman Church in these words: "Where my doubts were really troubling me was inside the confessional box. People coming to me, kneeling down in front of me, confessing their sins to me. And I, with the sign of the cross, was promising that I had the power to forgive their sins. I, a sinner, a man, was taking God's place. It was God's laws they were breaking, not mine. To God, therefore, they must make confession; and to God alone they must pray for forgiveness." ("R.C." p. 203). In fact, the only word in the Bible about confessing sins to anyone other than God, is found in James: "Confess your sins to one another and pray for one another, so that you may be healed" (5:16). It is obvious that the Lord meant what He says in Revelation, chapter 1, that "He has made us to be a kingdom, priests to His God and Father" (vs. 6), and Peter calls the church "a chosen race, a royal priesthood" (I Pet. 2:9). Believe it or not, the only mention of New Testament believers being priests is used in a context where all true believers are included, not just a select few. That is why James could say that we should confess our sins "to one another". Catholics love to quote the verse in John 20:23 to prove that priests do have the power to "forgive and retain" sins. "If you forgive the sins of any, their sins have been forgiven them: if you retain the sins of any, they have been retained." The powers of forgiving and retaining sins, were given to the apostles as proclaimers of the Word of God, not as priests. As we have just pointed out, there are no Christian "priests" in New Testament teaching and doctrine. Pastors, yes. Deacons, yes. Apostles, prophets, teachers, evangelists, yes. Priests, no! Jesus was telling His followers that by preaching the gospel, they were being given the power to declare that a person's sins were forgiven them by God! And if an individual, or group did not receive them and the forgiveness they offered in the name of Jesus, then they were instructed to "shake the dust off their feet" as a protest against them, and warn them that it would be more tolerable for Sodom and Gomorrah in the day of judgment than for them (Matt. 10:14-15). In other words, if a person rejected the apostles' preaching of the gospel, they had the right to tell that person that his sins were not forgiven, because they had rejected God's only provision for atonement of sins. "The one who listens to you listens to Me, and the one who rejects you rejects Me" (Luke 10:16). This power to forgive and retain sins, contrary to Rome's teaching, belongs to everyone who preaches the true gospel of salvation. In the Roman system, penance is one of the seven sacraments. 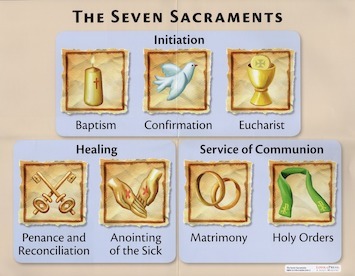 (The seven sacraments are: Baptism, Confirmation, the Eucharist, Penance, Holy Orders, Matrimony, and Extreme Unction.). The Baltimore Catechism defines penance as "the sacrament by which sins committed after baptism are forgiven through the absolution of the priest" (p. 300). Another catechism published in New York says, "the priest gives penance to help me to make up for the temporal punishment I must suffer for my sins. The penance given to me by the priest does not always make full satisfaction for my sins. I should therefore do other acts of penance...and try to gain indulgences." (Indulgences are remissions of so many days or months or years of punishment in purgatory--a subject which we will cover in depth in a future chronicle.) And in Instructions for Non-Catholics, we read: "After confession some temporal punishment due to sin generally remains. You should therefore perform other acts of penance also so that you may make up for these punishments, and avoid a long stay in purgatory." (p. 95). Here indeed is salvation by works. For penance, as the catechism says, involves confession of one's sins to a priest and the doing of good works as the only way by which sins committed after baptism can be forgiven. The Church of Rome thus demands acts of penance before She grants forgiveness, inferring that the sacrifice of Christ was not sufficient to atone fully for sin and that it must be supplemented to some extent by these good works. "Let the wicked forsake his way, and the unrighteous man his thoughts; and let him return to the Lord, and he will have mercy upon him: for he will abundantly pardon" (Isa. 55: 7). The easy way in which the Church of Rome deals with sin is seen in this doctrine of penance. The penitent receives pardon on comparatively easy terms. He is assigned some task to perform, usually not too hard, sometimes merely the recital of a given number of "Hail Mary's". The result is that he has no qualms about resuming his evil course. It shocked Martin Luther when he read the Greek New Testament edited by Erasmus, that Jesus did not say "do penance" as had been translated by the Roman Church, but "repent". In short, penance is a counterfeit repentance. It is the work of man on his body; true repentance is the work of God in the soul. The divine Word commands, "Rend your heart and not your garments" (Joel 2:13). Penance is "rending the garments" an outward form without inward reality. Good works, of course, are pleasing to God and they have an important and necessary place in the life of the Christian. They naturally follow if one has true faith, and they are performed out of love and gratitude to God for the great salvation that He has bestowed. Good works, in other words, are not the cause and basis of salvation, but rather the fruits and proof of salvation. "Not by works done in righteousness which we did ourselves, but according to His mercy He saved us through the washing of regeneration and the renewing of the Holy Spirit" ( Titus 3:5). The born-again Christian produces good works as naturally as the grapevine produces grapes. They are a part of his very nature. He performs them not to get saved, but because he is saved. Grace, just because it is grace, is not given on the basis of proceeding merits. By no stretch of the imagination can a man's good works in this life be considered a just equivalent for the blessings of eternal life. But all men because of pride, naturally feel that they should earn their salvation, and a system which makes some provision in that regard readily appeals to them. But Paul lays the ax to such reasoning when he says: "If a law had been given which was able to impart life, then righteousness would indeed have been based on law" (Gal. 3:21). Time and again the Scriptures repeat that salvation is of grace, as if anticipating the difficulty that men would have in accepting the fact that they would not be able to earn it. "And Abraham believed God, and it was reckoned unto him as righteousness. Now to the one who works, the reward is not reckoned as grace, but as debt. But to the one who does not work, but believes in Him who justifies the ungodly, his faith is reckoned as righteousness" (Rom.4:3-5). The first consequence of the doctrine of penance (as well as the doctrines of purgatory and indulgences) is that the Roman Catholic, though baptized and confirmed, can never have that assurance of his salvation and that sense of spiritual security which is such a blessing to the true Christian. In proportion as he is spiritually sensitive, the person who holds to a works religion knows that he has not suffered as much as his sins deserve, and that he can never do as much as he should in order to be worthy of salvation. The Council of Trent even pronounced a curse upon anyone who presumed to say that he had assurance of salvation, or that the whole punishment for sin is forgiven along with that sin ("R.C." p. 267.) Such assurance is pronounced a delusion and a result of sinful pride. Rome keeps her subjects in constant fear and insecurity. Even at death, after extreme unction has been administered and after thousands of rosary prayers have been said "for the repose of the soul", the priest still cannot give assurance of salvation. The person is never "good enough" but must serve in purgatory prison to be purified of venial sins before he can be admitted to the celestial city. No one can be truly happy or truly at peace. And particularly in spiritual matters, a state of doubt and uncertainty continues for one's whole life, and right into the grave. But God wants us to be saved, and according to the Bible the Holy Spirit can give us the assurance that we have salvation when we have a true, intimate relationship with the Son of God (I John 5:9-12). But in Romanism, one must work hard for it and must pay dearly for it, and after he has done all that the priest has prescribed, he still cannot know whether he has it or not. And through it all, there stands the anathema of the Council of Trent against all who affirm the certainty of their salvation. Hence, there cannot truly be found anywhere a Roman Catholic, consistent to what his church teaches, who enjoys the true assurance of eternal life. To merely call such a system "a cult", would be to throw it into the vast category of religions and quasi-religions that are currently making the rounds of our college campuses and city streets, snatching up many-an-unsuspecting youth. No, the Roman Church is not a cult. It's an empire! With its own ruler, its own laws, and its own subjects! The empire has no borders, it encompasses the globe with its eye on every person who does not vow allegiance. It calls the members of other faiths "separated brethren" (The term used by Vatican II to describe the members of Eastern Orthodox, Anglican, and Protestant churches.) and has as its goal the eventual bringing together of everyone under its flag. Mouths that used to speak out boldly against the Church of Rome have been quieted by the times. It no longer is in vogue to speak of the pope as "the antichrist" (Although the following people unhesitatingly did: Martin Luther, John Bunyan, John Huss, John Wycliffe, John Calvin, William Tyndale, John Knox, Thomas Bacon, John Wesley, Samuel Cooper, John Cotton, and Jonathan Edwards.) or the Catholic Church as the "whore of Babylon". Now Protestants unwittingly believe that "our differences are not so great". Ah, that is just what She wants us to think! I've never completely understood why God led me to write these articles. But it becomes more clear with each day of study, and each page of research. Never has something so black and wicked, gotten away with appearing so holy and mysteriously beautiful...for so long!